Natural Herbal First Aid Solution to help cleanse cuts and scrapes, disinfect minor wounds and stop bleeding. Recommended for use along with PureHeal Gel. See our discounted Combo Pack! How has Pure-Clenz helped others? How do I use Pure-Clenz Solution? How long does a bottle of Pure-Clenz last? How will I know if the wound is infected? Tripping over the kids’ toys. Shaving too hastily in the morning. Greeting the kitchen cupboard with your knee… these are all instances where minor cuts and everyday scrapes can occur. No matter how superficial or small the wound is, there is no mistaking that it can sting and cause temporary discomfort! Usually, with a band-aid and cleansing solution handy, you are back to going about your everyday tasks in under a few minutes! Nature's First Aid in a Bottle! Bumps and scrapes are an inescapable part of life, regardless of age. Children are especially prone and their adventurous spirits and keen desire to learn by experimentation land can them in all sorts of trouble!Every home needs a safe and effective cleansing product on hand to safely and effectively deal with these minor accidents and to make sure that the normal healing process is encouraged. Pure-Clenz Solution is Nature’s First Aid kit in a bottle! Containing carefully selected herbs, used for generations to safely cleanse and facilitate healing, Pure-Clenz is the Natural Solution! Not only will Pure-Clenz carefully cleanse the affected area, but it will also help to reduce bleeding and promote infection free healing. The carefully selected herbal ingredients in Pure-Clenz are 100% safe and natural and have a long and well documented history of traditional use for skin injuries. Keep Pure-Clenz Solution on hand to get to work quickly and effectively on all your family's bumps and scrapes. Like all Feelgood Health products, Pure-Clenz Solution has been developed with care by our practicing Clinical Psychologist and is manufactured according to the highest pharmaceutical standards. Individual ingredients are well-researched and have been specially chosen for their high safety profile in natural family health. "Pure-Clenz is the mainstay of my medicine chest at home. Between my husband, a DIY enthusiast, our three children and myself we must use Pure-Clenz at least once every week in our family. It is the only product that I ever use as it works fantastically. My children love it because it doesn’t sting ......and it stops the bleeding right away. We always use your Pure-Heal gel afterwards and are thrilled with the way they work. So far no infections and no scarring in our family!" "My mother is getting on in years and she has very thin skin which is easily damaged - she just has to brush past the kitchen table and she will cut herself. It has been an ongoing battle looking after these cuts and scrapes as they tend to get infected so quickly and, at her age, infection really worries me. Pure-Clenz has really helped her. It works fast, she bleeds much less and she heals much quicker.”"
"Thank you for your great products! I have just added Pure-Clenz and Pure-Heal to my collection and I am so impressed with the way that they work. Keep up with the great new products!" Agrimonia eupatoria (Agrimony) is a well-known astringent herb which helps to tighten and constrict tissues and will therefore help to staunch blood flow and diminish blood loss. In addition, the natural properties of Agrimony will assist with recovery and promote the natural healing process of the cellular tissue. Hamamelis virginiana (Witch Hazel) has a long history of use among Native Americans and is found in numerous commercial skin care and treatment products. Like Agrimony, the natural astringent properties of Witch Hazel are invaluable in the healing process. Achillea millefolium (Yarrow) According to legend, Yarrow was named after Achilles, the Greek mythical figure, who used it to stop the bleeding wounds of his soldiers. Calendula officianalis (Marigold) is one of the best and most highly respected herbs in the management of local skin problems. Calendula is an effective first-aid solution for all minor burns and scalds, as well as any skin abrasion. Calendula will also benefit the healing process by stimulating the natural process of healthy skin and tissue regeneration. Pure-Clenz Solution contains less than 1% pure pharmaceutical grade ethanol when diluted as directed. Add 15 drops to approx. 25 ml warm water and gently cleanse the affected area using cotton wool soaked in the solution. Pure-Clenz Solution is for external use only. Note: For best results apply Pure-Heal Gel after cleansing with Pure-Clenz. Try our Real-Heal Tablets to promote healing from the inside out. Applying Pure-Clenz Solution to the affected area will immediately reduce any bleeding and cleanse the lesion. Regular use thereafter, along with Pure-Heal Gel will promote rapid and healthy healing. This will depend on the frequency of use. However, Pure-Clenz is strong and concentrated and a little goes a long way! 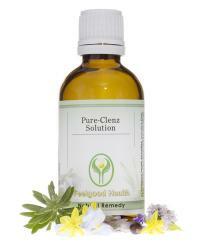 Pure-Clenz Solution comes in a 50ml bottle. Wash up – if at all possible wash and clean your hands thoroughly before dealing with any open wounds. If you have any surgical gloves available wear them. This will help to reduce the risk of introducing infection into the wound. Stop the bleeding – this is the first step in wound care and most minor cuts don’t bleed excessively and often stop on their own in time. If they don’t, apply gentle pressure to the wound with a clean cloth or bandage for 20-30 minutes. Don’t keep lifting the cloth as this may damage or dislodge the clot that is forming and the bleeding could resume. Clean the wound – Scrub your hands well and then rinse the wound with plain clean water to dislodge any infective particles that may be embedded in the wound. Do not use soap on the wound itself as this may irritate the broken tissue. You can use tweezers soaked in alcohol to remove obvious debris stuck in the wound. Cover the wound – While smaller wounds, abrasions and insect bites can be left open to dry, deeper cuts may need to be covered for awhile. This will help to keep harmful bacteria away from the open wound and will also make it difficult to scratch and pick at the wound, all of which can introduce infection. Don’t blow on the wound – this can introduce infection. Covering wounds is especially useful for children – they love bandages and plasters and it can stop them from picking at their injury. Remove the covering once the wound has healed enough to make infection unlikely as exposure to air will now aid healing. Change the dressing whenever it gets dirty or wet and at least once a day. Watch for signs of infection – If you notice any redness, swelling or pus or feel any throbbing pain, please see your health care practitioner as the wound may be infected. While most cuts and scrapes can be effectively dealt with at home, there are occasions when you will need to seek medical assistance. Bleeding is not stopping with continuous pressure or is profuse. Any blood loss that appears to pump or come in spurts requires urgent medical attention as it may indicate an injury to an artery. Cuts that go below the top layer of skin and may require stitching. In general the sooner the stitches are put in, the lower the risk of infection and scarring. People with decreased immune system, (e.g. cancer patients and those on long term cortisone medications) are more likely to develop an infection and should seek medical care. Diabetics are also more prone to developing infections and should take extreme care in treating wounds, especially to the extremities. Puncture wounds, (e.g. from stepping on a nail) can be extremely deep, introducing infection deep into the tissues and even into the bone if they have penetrated far enough. Use the same first aid tips as above, keeping the affected body part elevated, and if you have any suspicions that bone may have been penetrated or that there is infection please consult your doctor. High risk wounds should be seen by a doctor. These include animal and human bites, wounds with embedded gravel, deep puncture wounds and wounds with ragged edges. The elderly and those with vascular or circulatory problems are also more prone to infection and may need to seek medical care sooner rather than later. Any injury in or near to the eye should be evaluated by your doctor. Red streaking of the skin around the wound can indicate that the infection has entered the lymphatic system. This can be serious and you should seek prompt medical care. Complete Clean: Natural disinfectant to clean wounds plus natural healing gel!